Courtesy photo Four generations of Asher Shoop’s family include (from left): Ronnie Shoop of Roaring Spring, father; Ron Shoop of Duncansville, grandfather; and Ron Shoop of Hollidaysburg, great-grandfather, holding Asher Shoop. The Altoona Mirror accepts photos of families who recently added a fourth or fifth generation. Photos will be published at no charge on the Community News page. The photo may include one representative of each generation and should include identifications for everyone in the photo. It should include the person's name, town and how they are related to the baby in the photo. Photos should be submitted within six months of the new addition and can be emailed to community @altoonamirror.com or mailed to Community News, Altoona Mirror, P.O. Box 2008, Altoona, PA 16603. Please include a daytime telephone number. For more information, call Brenda Carberry at 946-7459. 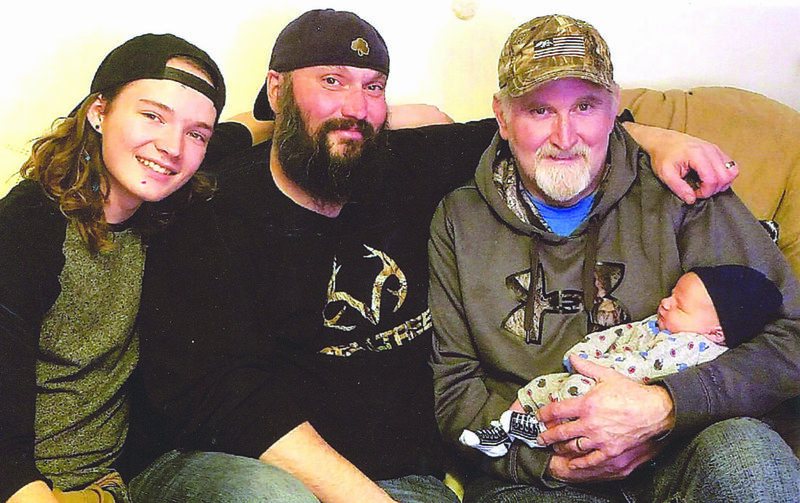 Four generations of Asher Shoop’s family include (from left): Ronnie Shoop of Roaring Spring, father; Ron Shoop of Duncansville, grandfather; and Ron Shoop of Hollidaysburg, great-grandfather, holding Asher Shoop. @altoonamirror.com or mailed to Community News, Altoona Mirror, P.O. Box 2008, Altoona, PA 16603. Please include a daytime telephone number. For more information, call Brenda Carberry at 946-7459.